After many long months, I was able to get together with my quilting buddies this past weekend. We used to quilt weekly, but life kind of got in the way, so there hasn't been much quilting time lately. Just wanted to give you a little peek inside my quilting buddies sewing room. And I'm still schnibbling along. The deadline is looming, so I hope I will make it! Don't forget about my little giveaway. If you would like to enter, please make a comment on Monday's post! ....like fall is coming. Even in the south the air is not quite so hot and the days are getting shorter. We do not enjoy the burst of color that runs like a wave a little further north, but we will enjoy the cooler evenings. I've added a little bit of fall to my blog with a new background. I found this on "Simply Blog It" Backgrounds. The soft fall leaves and blue background were such a nice c0mbination that I thought I would try it. Of course I found this through one of my favorite blogs "Freebies for Crafters". If you've never visited there before, you are missing a lot of wonderful FREE craft ideas. These girls really have found some great sites. Last week I was in the area of another quilt shop. As I had not been there in quite a while, I thought I would stop in and visit. Just so you don't miss the turn off. This is the husband's porch. It overlooks a small butterfly garden. Great place for the Misters to wait for their browsing Mrs.
Hopefully you have hung with me this far, because while I was browsing in this little shop I thought that it's time to have another little giveaway. It's always so much fun to win a giveaway, and also to have a giveaway! I'm giving away four Fat Quarters plus 1/2 yard black striped fabric, 1/2 yard of the red black and grey floral, two spools of Essential Threads (Black and Smoke Grey), a spool of Sulky Bobbin Thread, and a roll of Seamless Quilt Binding (2 1/2" x 12 yards). So that's it! You know the routine. Leave a comment on this post, and be sure that I have a way of contacting you, either through your blog or email. Internationals are more then welcome! I will leave this giveaway open until Saturday 10/3. Winner will be announced on Monday. Thanks to all of you who follow my little blog. I can't tell you how many times I sit here at the computer and read your sweet comments. I have so enjoyed reading your blogs and getting to know many of you. When I started this conversation I had no idea there were so many quilting blogs out there. 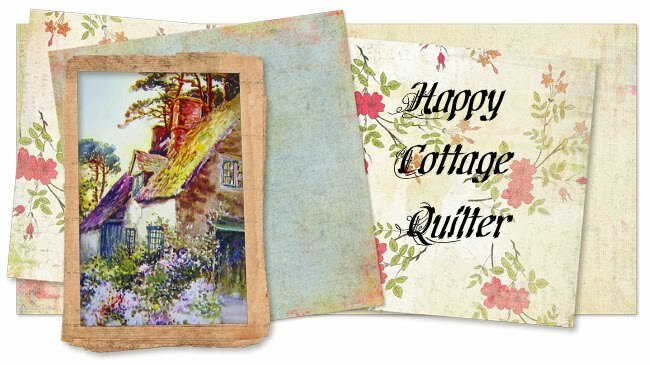 It has been such a joy to find a whole new way to find quilters and talk with all of you. You are all so creative, talented and generous. I've enjoyed reading and learning from each of you. I will probably never meet you face to face, but I do love to drop in and have a little visit with you. I have to admit, this "Fit to Be Geese" ruler is a pretty neat tool. You basically line up your geese with the lines and cut. Hopefully it will all go together straight. My dear sweet friend Crispy has asked me to share a picture of the goodies I found on my recent trip to North Carolina. The visit to Mary Jo's was the most productive :-) We just felt that we needed to do our part to stimulate the economy. The fabric selection was huge, and I found the most delicious array of Civil War fabrics. And I also found some Signature thread that is no longer available in our area. I used to buy this thread all the time at JoAnn's but they no longer carry it. Then we went to the little quilt shop in Charlotte called QBee's. I fell in love with this panel. I don't usually do many quilts with panels, but this one was made up as a shop sample and I loved it. The red background fabric was on sale for 50% off, so it was "all missions go"! I also could not resist this cute charm pack with a free pattern. The shop owner told us we could pick out a couple of fat quarters, so I picked out the black and white ones. It was just such a pleasant shopping experience, and if I am ever back in that area, I would plan to pay them another visit. Working on getting my son's school records finished and submitted for last year's work. If you have a few minutes, please pop over to my Thrifting blog as I have submitted a picture for I Heart Faces - Completely Candid Photo Challenge. You can also visit lots of other photo blogs. There are some really great pictures on this site. Whoo-hoo, guess what came in today's mail!! Yep, the fabric I ordered from cottoncharm.com. Thank you Cotton Charm girls for wrapping my fabric order in plastic. There is no telling what might have happened otherwise. So now I have the fabric that I need for the Schnibbles, and I bought this ruler yesterday to make those ever wonky Flying Geese. Geese ARE supposed to fly in formation, right?? Just to be sure, there is a great tutorial on using this ruler on Carrie Nelson's blog. Okay, you know whenever we travel it is very important to scope out the local quilt shops. Well last weekend I was with my dear hubby and son in North Carolina. They were busy doing competitive guy stuff, so that meant that us gals had to do a search and rescue of fabric, somewhere!!! Wow, I have been wanting to get to Mary Jo's for years. And here we are!! It was a pretty huge store with lots of fabric. They not only carry quilting fabric, notions and supplies, but half the store has upholstery fabric, and bridal too. Their prices are SO good! I found several pieces of Civil War fabric for around $5.00 a yard. So it was a great way to stock up on backing material. Our next stop was this VERY cute shop in Charlotte called QBee Quilts. And on Saturday we ended up in a totally awesome Quilt shop called Linderalla's. Isn't that just the cutest name?? I just love the names of Quilt shops. So imaginative. Anyway, that is where I found the Glace fabric that got me rolling for the Schnibbles (and of course got me in trouble cause I didn't get everything I needed there :-( It was a very fun quilt shop experience. We almost did our own Shop Hop. Do you ever have an opportunity to check out the LQS when you travel?? I think that is part of the fun of exploring new areas! Thank you all so much for the kind comments about the tour of my area. I've always had an interest in history, and it's fun to find there is so much significant history that took place locally. So now, I am returning to my quilting blog. But I am frustrated! I've signed up for Schnibbles, where we make a new project each month designed by Carrie Nelson. I found a charm pack of Glace by Three Sisters while we were on our trip to North Carolina. Fully assuming that I would be able to find coordinating fabric when I got home. I have called every quilt shop within an hours drive, and no one, NOT ONE quilt shop carries Glace!!! So what's a girl to do?? I could order it online, but now I will have to wait and I'm running out of time. Does anyone else have this problem where you live?? I've noticed more and more that the quilt shops in our area do not carry a lot of the beautiful fabrics that I see online. No Tula Pink, less and less of the traditional fabrics. I guess because we live in a tropical area the LQS feel they have to carry a LOT of batiks and novelty prints. When I've visited my BFF in Ohio I am so amazed at all the fabric collections they carry that I LOVE! I think this is one of my favorite places. I think every town has a little red school house, but this one is special. Can't you just see them doing a fire drill, and kids pouring out of the building, charging down these steps. I imagine it was a day to remember (poor teachers)! And of course playing out in this green field, or eating lunch on the grass. There was a huge controversy when the road was going to be widened. The county wanted to move the school, but there was almost an uprising over this issue. The school has since been placed on the National Historical Registry, so it may now rest in peace. Spanish explorer Ponce de Leon arrived at Tampa Bay in 1513, but Spanish explorations then focused on the east coast of Florida. It was not until 1824, three years after the U.S. purchased Florida from Spain and two months after the first American settler arrived, that four companies of U.S. Army troops established Fort Brooke to protect this strategically important harbor. Development of the community did not really begin in the area until 1845, after the close of the Second Seminole War the village of Tampa was incorporated on January 18, 1849 and again as a town on December 15, 1855. Fort Brooke fell to the Union in 1863 and after the American Civil War, the Reconstruction period was one of hardship in the area. A small fishing village, often plagued by yellow fever due to the mosquitoes, and with few land links, Tampa did not begin to prosper until phosphate was discovered in the Bone Valley in 1883. The mineral, vital in the production of fertilizers and many other products, was soon shipped northwest to the Port of Tampa in great quantity. The coming of Henry Plant’s Atlantic Coast Line railroad to Tampa finally provided a reliable overland connection, allowing fish and phosphate to be shipped north. Plant also ran a steamship line out of the port in Tampa that connected south to Cuba. This link to Cuba, along with the Tampa Board of Trade helping Vincente Martinez Ybor move his cigar manufacturing operations from Cuba to Tampa, brought a large new industry to Tampa. Ybor built hundreds of homes for his employees, and this influx together with new supporting trade, helped to build up the town. Ybor City, as the neighborhood became known, still occupies two square miles near downtown Tampa. Many Italian—mainly from Sicily—and eastern European Jewish immigrants also came to the area in the late 1880s. Today’s Amtrak trains pass through this historic neighborhood. Union Station opened on May 15, 1912 to serve the Atlantic Coast Line, the Seaboard Air Line, and the Tampa Northern railroads. Designed by architect J.F. Leitner in Italian Renaissance style, the station was managed by the Tampa Union Station Company. It was added to the National Register of Historic Places on June 5, 1974.
copied from "The Great American Stations"
The building was renovated in 1999. I wish I could say that the station is in a good part of town, but it is not. However with transportation between Tampa and Orlando costing less then a tank of gas, it has become a new found resource of transportation. We live in an area that is steeped in history. It has more interesting historical factors then two Super Bowls. Where my dear hubby grew up, there were Indian mounds where he and his brother would find all kinds of Arrow heads. In the 1800's the railroad came to town. And this hotel was built to accommodate many wealthy northerns whose desire was to escape the frigid winters. Let me tell you, this is one magnificent building. Built by Railroad owner, Henry B. Plant, The Tampa Bay Hotel was in a class of it's own. Henry Plant built several hotels along his railroad line. This one may be the only one that has survived. The hotel was financed by Plant personally, not investors, at a cost of $2,500,000 and an additional $500,000 was spent for furnishings. It took two years to build, covered six acres and was one-quarter mile long. The 511 rooms were the first in Florida to be electrified. There were many celebrated guests of the hotel, most noteably Theodore Roosevelt. Teddy Roosevelt headquartered his Rough Riders at the hotel before deploying to Cuba. The hotel closed after Henry B. Plant died, but the city eventually bought it from his heirs. It now houses a University, but the building still stands in all of its magnificent beauty. When you live near a big city, there are all kinds of events that take place. Football, Basketball, Baseball, you name it, it can be found within driving distance. So probably one of the most well known venues in our city takes place here. We've experienced two Super Bowls here, but I am very glad to say that our city worked very hard at making it the least intrusive for it's citizens. We would never have known that the Super Bowl was in town. There is also a major University which draws thousands of students every year. The Sun Dome is built on the University campus, and it has been the host to many major events through the years. I've only been inside the Sun Dome once to watch a Basketball game. We were in the nose bleed section, so I really was able to get a full view of the facility. There are two major baseball teams that play here. The owner of one team lives in a quiet upscale neighborhood. I drive by his house when I am on my way to the Hospice Thrift store ;-) Tony Dungy and his family still lives in the northern area. They had put roots down here, and decided that they wanted to stay a part of our community. A Cuban sandwich is a variation of a ham and cheese originally created by Cuban workers, either in Cuba or in the Cuban immigrant communities of Florida, most likely Ybor City in Tampa, Florida. They were also served in Key West during the 1870's and later on in Miami where it is still very popular. The sandwich is made with ham, roasted pork, Swiss cheese, pickles, mustard, and sometimes salami on Cuban bread. These sandwiches are very popular around these parts. Now if you have stuck with me so far, tomorrow I'd like to share a few historic places. Have a great day! Karen from The Selvage Blog has been touring around the world visiting where crafters live. Just thought I would give you a little peek into my little world. We live in the suburbs of a very large city in Florida. It has grown by leaps and bounds over the last 25 years. But we have lived in our little cottage home for over 30 years. The trees however, just continue to share their shade. We have a huge oak tree in our back yard. The children used to have a tree house up there, but it has been a few years since this tree commanded the troops over our fort. It's just a quiet little spot, but I love to hear the water flowing. It is so refreshing to sit out there and just enjoy the water flowing over the cascade. Tomorrow I'd like to take you on a little tour of some interesting spots around our city. Hope you will come back and join me. You know how I have said that quilters are the best! They are some of the most generous people that I have ever met. Well Lola over at ...and Sew On is one of those special gals. I received a very sweet card in the mail yesterday. And inside that card was a little package. It was a beautifully crafted Tea Wallet! She even included two of her favorite teas inside the tea wallet. Which happen to be two of my favorites as well :-) She said it was a small token of joy. I'm just overjoyed that she would take the time to make this for me! Go on over and visit Lola and send her some comment love. She's such a sweet gal. I know you will enjoy visiting with her. I love to see homes decorated for the seasons. One of my biggest problems, living in the deep south, has been decorating for fall. When the temps are still in the 90's and flowers are still blooming, it's hard to wrap your mind around fall leaves and cool breezes. Well today I thought I would start to put out a few autumn colored things. Most are packed away in a box marked "FALL", so dear hubby will have to search for that box. I found a table runner and a couple of candles. But oh,oh! It looks like I have a few quilts that need to be quilted ;-) Guess I will be doing some sandwiching. I do love the warm colors of fall. These are the only leaves that will turn color around here! Many of the bloggers that do their machine quilting on their home sewing machine have shared with me that they've learned a lot from Patsy Thompson's videos. I've watched Patsy's intro's on her website, but never got around to ordering one of her DVD's. So finally after a round-d-round trip, I made my way to the JoAnnETC store. And YES, they had it! I was also happy to be able to use my 40% off coupon.